Paid staff plan new projects by applying their expertise to the intellectual challenges of the task. But it's clients who will feel the impact of their decisions. By the time service users give feedback, it may be too late (or expensive) to make corrections. Volunteers, who bring a wide range of perspectives as members of the public, are great at pilot testing options much earlier in the process. And they will love doing so! Read this month's Hot Topic. Energize celebrates all of our colleagues around the world who truly are "VOLUNTEER MANAGERS: The Power behind Super Hero Volunteers"! 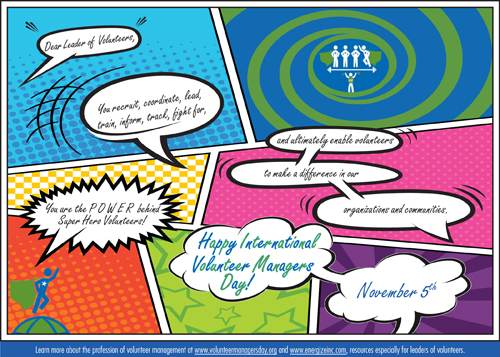 As we do every year, we have added to the wonderful set of free banners, postcards, and other graphics available on the International Volunteer Managers Day site with this 2015 ready-to-send e-card. Send your note of appreciation to leaders of volunteers you know! Leaders new and seasoned will find enrichment in Barry Altland's new book, Engaging the Head, Heart and Hands of a Volunteer. Barry expertly digs deep into what motivates volunteers to serve and offers guidance for tapping the roots of those motivations. He explains how the skills of coaching allow leaders to bring out the best in every volunteer. Real-life examples, charts, steps and practical tips make this new addition to the volunteer management "toolbox" an enjoyable, satisfying growing experience. Now available in the Energize Online Bookstore. Volume XVI, Issue 1 of e-Volunteerism, our international, subscription-based journal for informing and challenging leaders of volunteers, opened on October 15th with its usual array of new and interesting articles. Volunteering at Ground Level - "Spontaneous" volunteering is an emergency response to natural and other disasters. It shows the essence of the volunteer impulse. The gap between the official response of the governments of Europe and the private actions of their citizens to the alarming exodus of refugees from Syria and other Middle East hot spots raises some important issues about self-directed volunteering. Susan Ellis and Rob Jackson discuss the arrogance of trying to structure it. Reactive or Proactive Volunteer Leadership: We Have a Choice - When it comes to volunteer leadership, experienced volunteer manager Meridian Swift believes that two models dominate: reactive or proactive. We need to direct our futures more. Over the next three months, new articles will be posted to this issue, including: an examination of the similarities and differences between volunteer management and community organizing; a Training Designs piece on the importance of reflection to learning; an interview with Little League International to examine how they work with all those male volunteers; and more. As always, the content of all previous issues will remain accessible in the journal's Archives. Earlier this year, VolunteerMatch and the publisher Wiley produced a great new book, Volunteer Engagement 2.0: Ideas and Insights Changing the World. Although the purpose of the volume, with chapters by 35 different field leaders, was to reveal the future of volunteer action, I was specifically recruited to write one of the introductory chapters, "A History of Change in Volunteer Engagement." I was very happy to be given the chapter that links the past with the future, because I believe we can learn a lot from history. It's rare to find the word volunteer in historical accounts, even though the formation of new legislation, institutions, and cultural attitudes are mainly the outcome of the collective, unpaid actions of individuals willing to roll up their sleeves and put themselves into action - or, by any other name, volunteers. Whether in government, nonprofits, or businesses, volunteers are the mavericks, protestors, and activists who recognize the need for action before it's someone's job or there's profit to be made. Just think about the recent evolution of hospice services, disability rights, open source Internet software sharing, the outcry against drunk drivers, or the protests over police misuse of power. As I ask at the start of my chapter: Who dumped the tea into Boston Harbor? No one is ever paid to start a revolution. Of course, while some people love the challenge of starting something brand new, other volunteers make it their mission to support organizations proven to matter. We understand that money donors write checks to causes they want to see succeed. In a more personally committed way, volunteers are time donors putting themselves where their beliefs are. Let's start calling volunteers skill-anthropists, expressing an emphasis on their talents, not just their time. History teaches that where there is change, there will be volunteers. Whether reactive to societal trends or proactive in urging solutions to problems, we can safely predict that volunteers will find whole new causes in the years to come. Most organizations do not have a vision for volunteer involvement and so do not approach it strategically. Without respect for the proven power of volunteers, they tend to focus on finding and deploying "unpaid helpers" efficiently. The great thing is that leaders of volunteer engagement can take initiative. What do we want our purpose to be? Are we about volunteers or solutions? We create most of the roles volunteers fill. Are volunteers always assisting employees, or do we open opportunities for them to lead, be creative, experiment, and dream - since that potential is always there? How do we react to new ideas posed by volunteers? Do we advocate for them to agency decision makers? How often do we intentionally recruit new volunteers for their different backgrounds, skills, or opinions? Do we recruit to fill vacancies on a roster or do we invite people with creativity and drive to join the fight for our cause? How often do we review volunteer position descriptions and ask: Is this still the most important and effective thing volunteers could be doing? And what do we do when the answer is no? Only in the Energize Online Bookstore: get a 25% discount on your purchase of Volunteer Engagement 2.0: Ideas and Insights Changing the World.